This recipe is so easy that I considered putting it in the Lazy Vegan bucket, but the end result is so delicious and potentially impressive that it’s more of a Secret Weapon Vegan Recipe. It involves few ingredients, few steps, minimal labor, and doesn’t take a lot of time. The “sauce” can be applied to any veggie or protein, so it’s also versatile. This dish is inspired by how my Mom used to bake chicken when we were growing up. She would buy a bunch of drumsticks, coat them with plum sauce, and just bake. Again… so easy, yet really tasty! 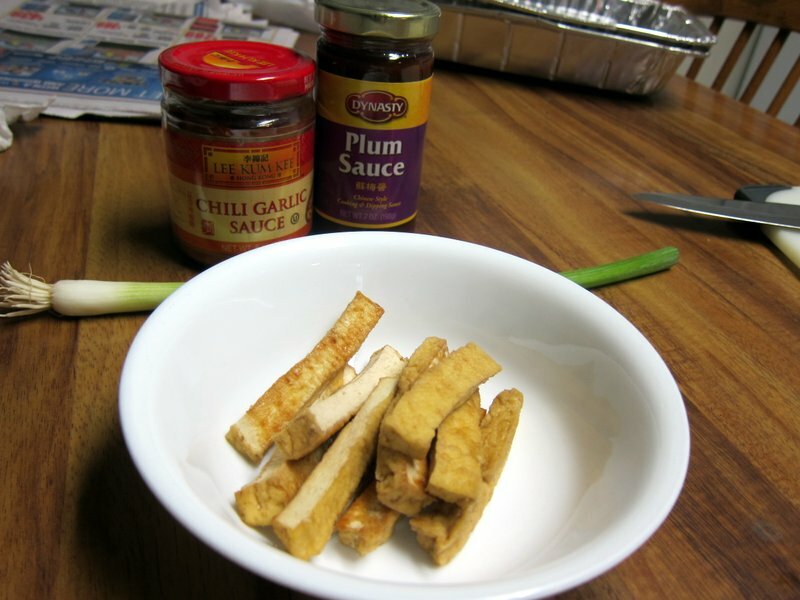 I got the plum sauce and chili garlic sauce from your everyday grocery store. I would recommend Lee Kum Kee brand for the plum sauce. My market didn’t have it and Dynasty brand worked just fine. 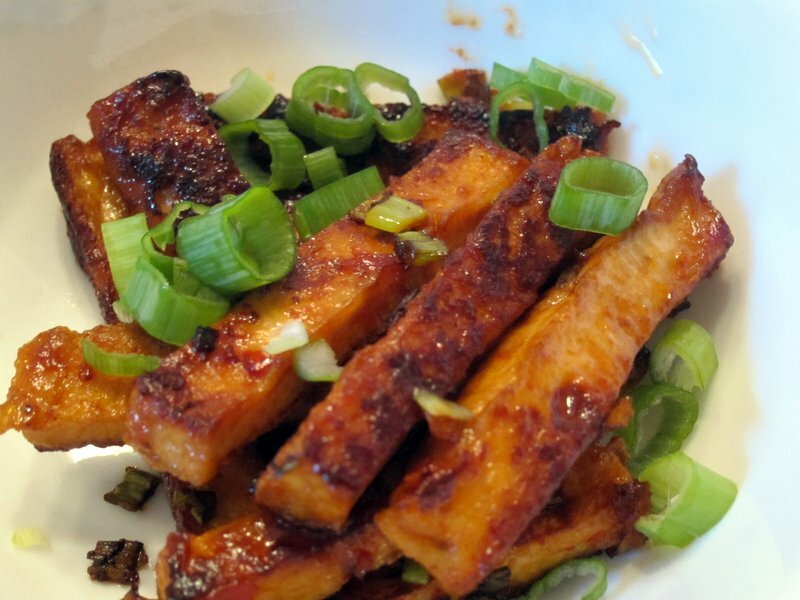 I used a block of tofu from a package of fried tofu, bought at the Asian market. I cut the block into strips, but you can cut it into any shape you would like. 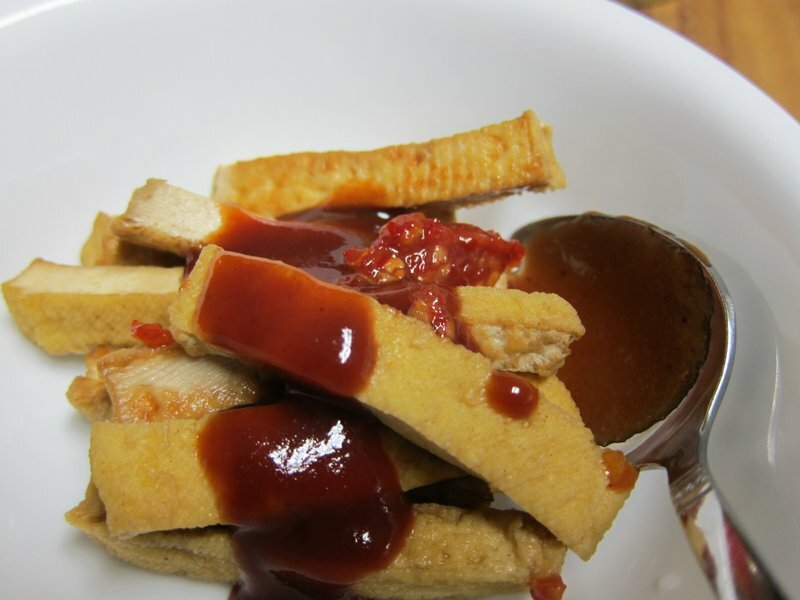 I coated the tofu strips with the plum sauce and chili garlic sauce. Add as much as you’d like! 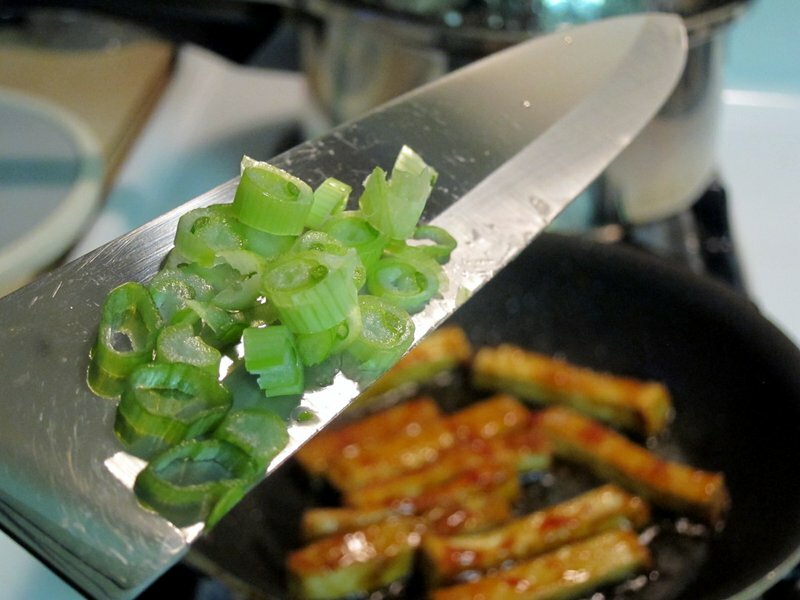 I heated up some oil in a pan and quickly chopped the green onion. Then I threw the coated tofu into the pan. I would have preferred to bake instead of fry, but I was really hungry and too lazy to wait for the oven to heat up. Beware: this is a messy fry. If you bake, make sure you get as much liquid as you can out of the tofu. This looks like the kind they serve at fancy restaurants… thank-you for sharing this!